Mount Magnet in the Murchison Region is at one with astronomy. Aboriginal astronomy stories of the Badimaya, the Aboriginal people here – still speak to the present age. Step out of town to experience the Milky Way from horizon to horizon, the black overarching emu in the sky – indicating time to collect emu eggs. From ancient Aboriginal observations, to present futuristic radio astronomy projects in Murchison Region – Mount Magnet celebrates the importance of astronomy and rocks here! 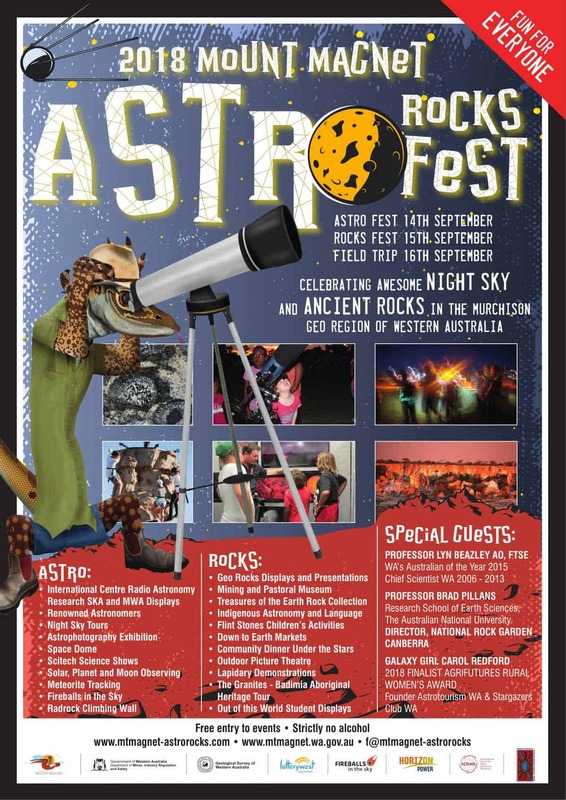 A collaborative project, the MOUNT MAGNET ASTRO ROCKS FEST is a day-night event. Join us to discover the awesome Universe above and ancient rocks beneath our feet.